The military promises to feed you, and they do so primarily by using three separate methods: chow or mess halls, basic allowance for subsistence, and meals-ready-to-eat. If you are enlisted and reside in the dormitory or barracks, in most cases, you will be given your meals for free. Different services have different names for this. In the Air Force, it's called being on a Meal Card (although physical cards are rarely used anymore). Most chow halls offer four meals per day: breakfast, lunch, dinner, and a midnight meal. Some are open 24 hours a day. For the health conscious, there is a heart-healthy menu, as well as a salad bar. For breakfast, you can choose anything between a small fruit cup to a full-fledged made-to-order omelet with all the side dishes. Take-out cartons are freely available in many chow halls. Some military dining facilities even have drive-through windows. In recent years, the military has been trying to reduce the number of chow halls at its facilities, as the size of the Armed Services has shrunk. And the menus are becoming more and more healthy, which may deter some younger troops from partaking, especially if inexpensive fast food is readily available nearby. Other than a few exceptions at some military training centers, boot camp, while embarked on a vessel, while deployed, etc., kitchen patrol, or KP, duty is a thing of the past. Most military dining facilities are contracted operations, so troops aren't assigned to KP. Although there are procedures to be reimbursed for missed meals, they are paperwork intensive and usually require justifications and explanations to the first sergeant and or the commander. Enlisted and officers receive full-rate BAS after initial entry training. However, for those required to consume meals in the dining facilities, most of the BAS is automatically deducted from their paychecks. For officers and enlisted people who do not reside in the dormitories, the military pays a monetary allowance for food. BAS is an allowance, not pay. It is not taxable. Officers are paid less BAS than enlisted personnel. The allowance is not designed or paid to provide any subsistence to family members. It is solely for the subsistence of the military member. It used to be that when an enlisted member deployed, and they received BAS, they would lose the BAS during the time of deployment (because they received "free meals" at the deployment location Chow Hall). However, responding to complaints of many service members following the first Gulf War, Congress passed a law requiring the military to continue to pay BAS to deployed members, if the member received BAS at their permanent duty station. Enlisted members who receive BAS are usually authorized to eat in the dining facility (they have to pay for the meal), but the number of meals they are allowed is restricted. 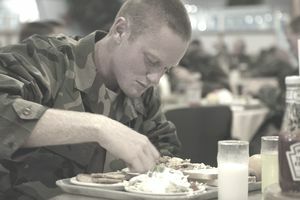 Officers may only eat in the enlisted mess for special purposes, requiring special permission (for example, a commander checking on the quality of meals). No article on military food would be complete without mentioning MREs. These have replaced the old C-rations and field rations. MREs are sealed, foil envelopes and can be heated or eaten cold. The packet contains an entree, a side dish, crackers and cheese spread, a dessert item, cocoa powder, and a few other misc. snack items. There are several choices of entrees. Every couple of years the Department of Defense surveys military members to find out which MREs were popular and which were not. Unpopular menu items are taken out of service, and new menu items are introduced all the time. You don't have to join the military to try an MRE if you're so inclined. They are available in many camping stores and most military surplus stores.